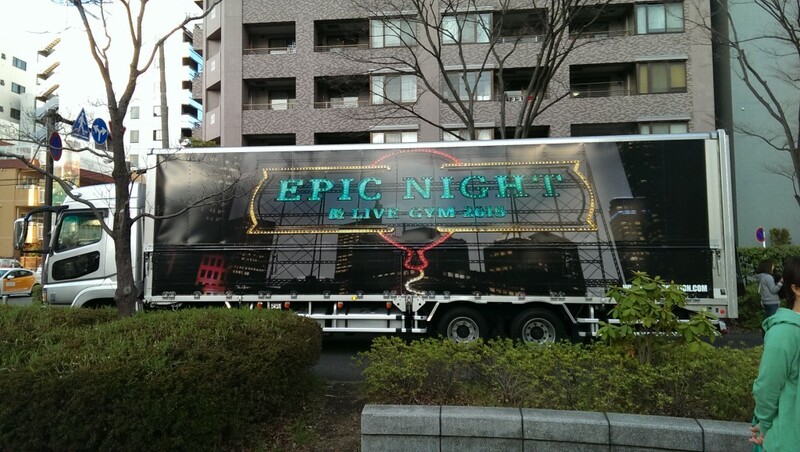 B’z has finally kicked off another tour, and this time it’s an album tour in support of their latest album, EPIC DAY. 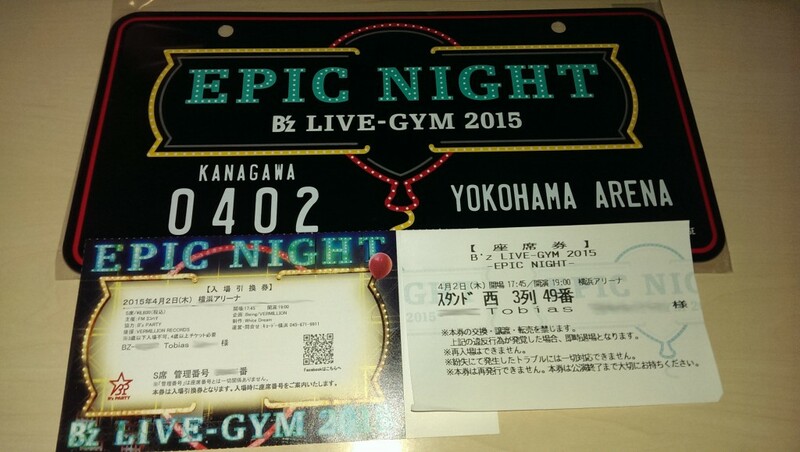 Last time, I went to their 25th anniversary tour B’z LIVE-GYM Pleasure 2013 -ENDLESS SUMMER-. 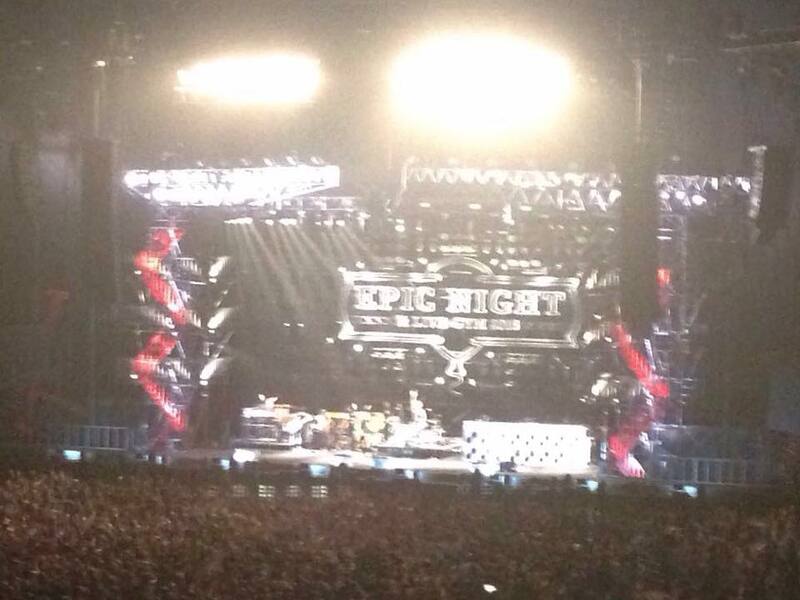 My expectations were high, of course, as I am used to great shows by B’z. So this time I chose to attend one of their hall shows (should I get tickets!) 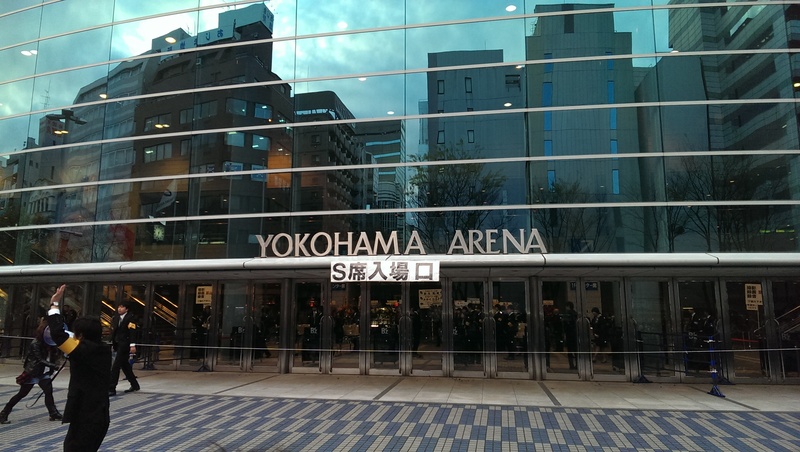 and went with Yokohama Arena, as these shows were in a time frame where I had time to make a trip to Japan. I entered the ticket draw through the official fanclub, B’z PARTY, and bam!, I was lucky enough to get four tickets to the show on April 2nd. My friends, however, weren’t so lucky, but I could provide them with tickets so they could attend as well. 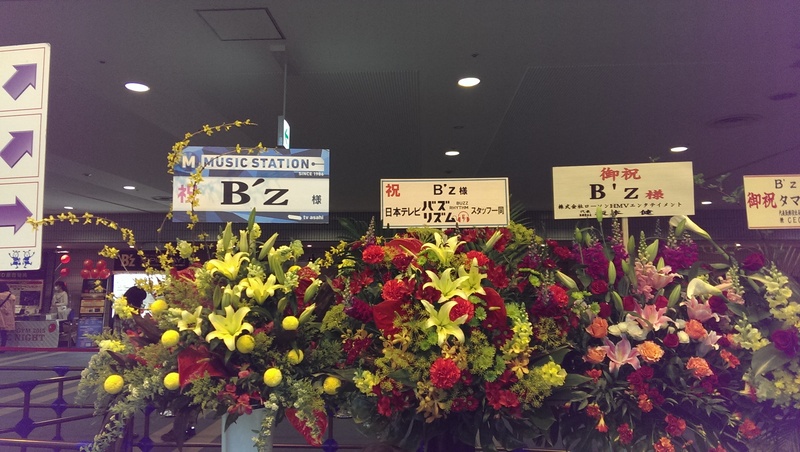 So how did B’z fare in Yokohama Arena on their latest tour? Find out in my detailed review after the break! I first met up with my friends at Yokohama Arena, so we could hang out and take pictures before the show. 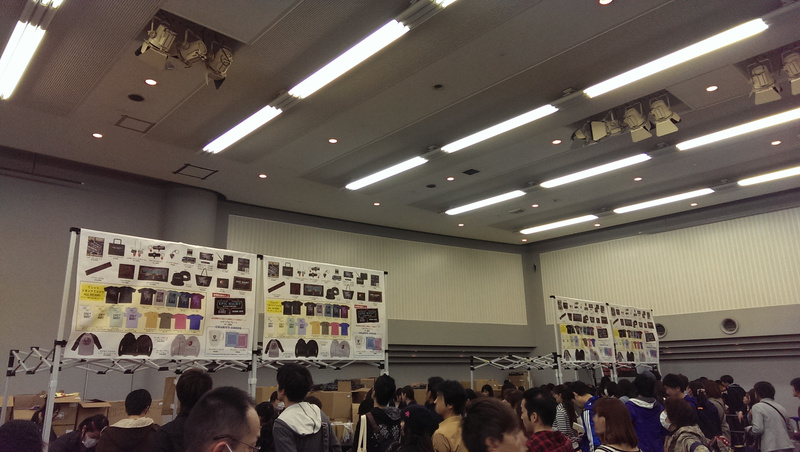 The area is quite huge, so we decided to meet at the tour merchandise booth, which was located inside the venue. 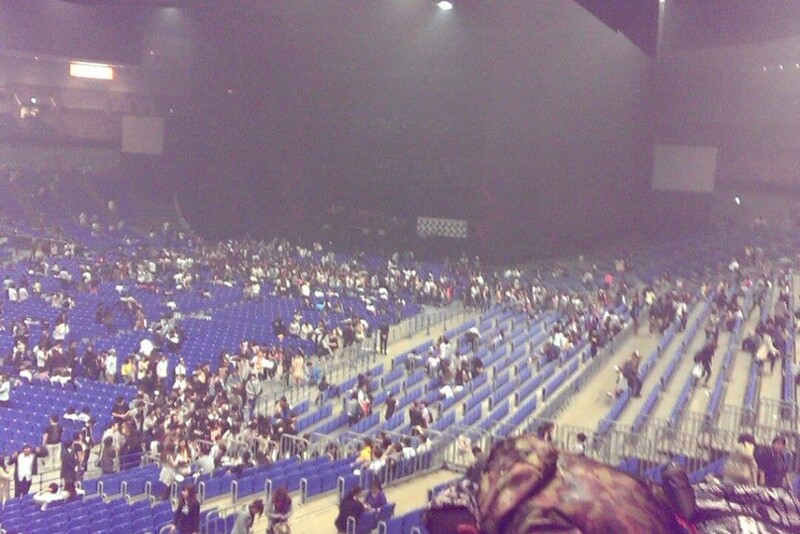 It wasn’t as crowded as compared to the stadium shows. I didn’t have to get in line, but could just walk up to the booth and get what I wanted. I was a bit disappointed with the tour T-Shirt this time, because the cloth is much thinner compared to previous tour T-Shirts. Afterwards, we went outside to go to the main entrance where the CD&DVD booth as well as the “EPIC DAY Rubber Band Exchange” booth were located. While walking around the arena, we also spotted the infamous tour trucks! Also, with every tour, if you spend more than 5,000 Yen at the CD&DVD booth, you get a chance to win a board signed by Tak and Koshi! And wow was I unlucky. Three(!) of my friends got one. Wow. But hey, you still get a poster! Better luck next time. We still had some time to kill before the doors open, but people were already getting in line at the main entrance, so we did the same. It was starting to get dark and thus cold, too, despite it being a nice warm day of spring in Yokohama. The staff kept us waiting for quite a while and told us not to go in although they already opened the doors. Rule-abiding Japanese fans did as instructed and so we all waited in front of the OPEN doors until the staff allowed us to enter the venue. That was really stupid. Once we were finally allowed to go in, we got our seat ticket… and, oh no! We got tickets on the stands… but little did we know, how far away from the stage that would actually be. 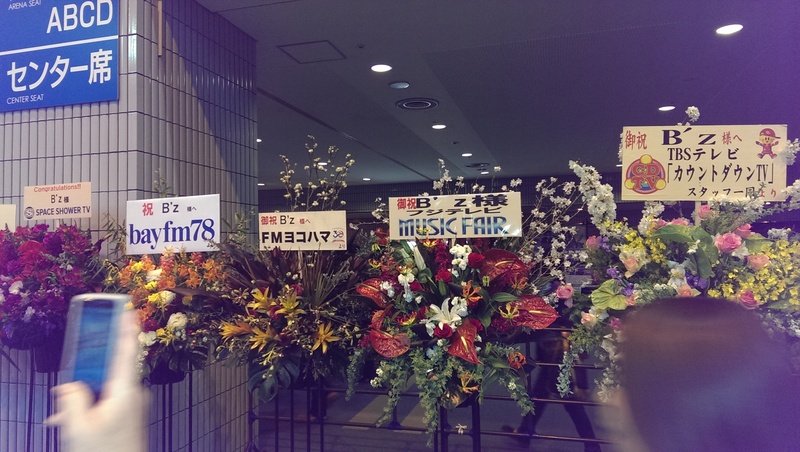 After entering the venue, we could take a look at a whole lot of flowers sent in by fellow musicians or TV show crews. One particularly stands out: The one sent by Taiwanese band Mayday. One of my friends from Hong Kong told me that there’s a rumor going on among Taiwanese fans that there might be a collaboration between Mayday and B’z. Well. We now made our way to our seats, wondering what kind of view we would get… And wow, we were almost in the back of the venue. “At least we can see everything well from the top”, we thought. At least until the show started, haha. Don’t let the picture fool you. It was in fact much farther away. We eagerly waited for the show to start as safety announcement and the like were made. But then the announcer said that the band will momentarily be on stage! And so everybody got up, excited, calling B’z out on stage. After a minute or so, the opening SE, 「Walking in the Shadow of the Blues」 by Whitesnake, was cued. While the song was playing, Shane, Barry, Ohga and Takanobu made their way to the stage, heating up the crowd. Shortly thereafter, the song faded into the intro to 「Uchouten」and Tak made his appearance on stage, followed by Koshi just moments later. The hype is on. Or is it? I found 「Uchouten」 to be a very weak opener for a show, and I think the rest of the crowd was with me on that. The excitement wasn’t so great. 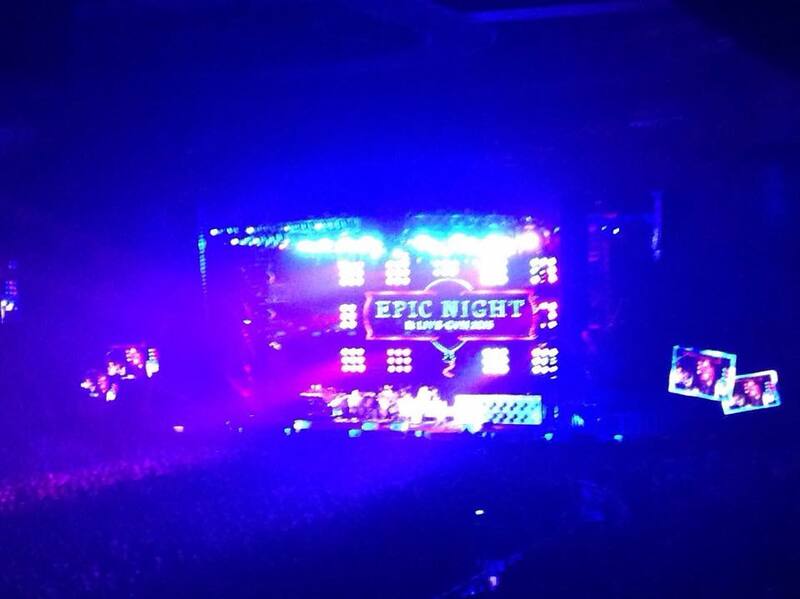 The show should’ve started with 「Las Vegas」 or 「EPIC DAY」 to get the crowd excited. 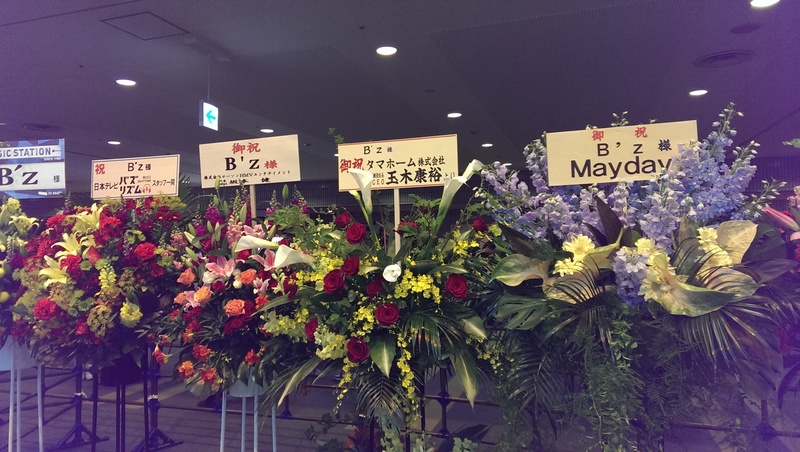 The band performed 「NO EXCUSE」 following 「Uchouten」 which then transitioned into the all-too-well-known 「B’z no LIVE-GYM ni Youkoso!」(Welcome to the B’z LIVE-GYM!). This time around, Koshi kept it simple. He just blurted it out and the next song on the setlist, 「Amari ni mo」 was cued. At that point, the excitement was literally gone. A medium tempo song right after the show opening?! That was interesting… The whole atmosphere changed a bit when the band played the fan favorite off the new album: 「Black Coffee」. However, the excitement wouldn’t return to the level of excitement you’d usually know from regular B’z shows. Of course, everyone was excited to see their favorite band again, but it was missing that extra level of hype I am used to. 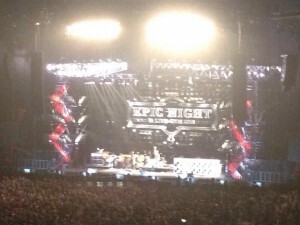 The crowd would go wild as soon as B’z played some of their less played songs, such as 「TIME」and「love me, I love you」. But the biggest surprise was 「Baby, you’re my home」 which has not been played in forever. Before performing the song, Koshi even said to the audience in an MC session: “Well, this is a song we haven’t played in a while… if you know it, please feel free to sing along! But there may also be some who think this is a new song…”. 「BE THERE」followed, which was a bit re-arranged and received a more rock’ish tone compared to its pop’ish tune in the original version. I was also glad to see 「Atsuki Kodou no Hate」 performed. Such a great tune. After the too-often-played 「ultra soul」, the band started to pull out the big guns with the songs they should’ve played in the BEGINNING of the show, namely 「Swimmer Yo!」,「BURN -Fumetsu no Face-」,「Las Vegas」 and 「EPIC DAY」. But with 「EPIC DAY」 the main part of the show ended and people were excited, waiting for the band to make their way to the stage again. The band played 「Ichibu to Zenbu」 as the first song of the encore part, which satisfied the audience well. I, unfortunately, get the feeling that 「Ichibu to Zenbu」 is going to be the new ultra soul. Played too many times. The show ended with 「Ai no Bakudan」 which never gets old. Never. The interesting fact to note is, that both Tak and Koshi just simply disappeared after the usual 「Otsukare!」 at the end of the show. 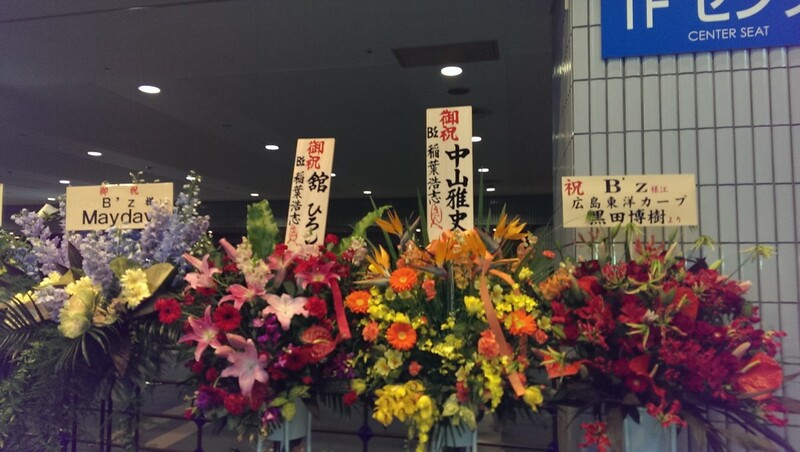 Usually, Tak and Koshi would stay around, saying their good-byes while 「Hitori Ja Nai Kara -Theme of LIVE-GYM-」 was playing. And they’d sing along here and there, and at least stay until the part where the audience is supposed to shout the name of the city. But they didn’t. They just left the stage. That was disappointing. We stayed a little longer to get to listen to the new unannounced song that was played after 「Hitori Ja Nai Kara -Theme of LIVE-GYM-」. And man, that was a really nice song. That’s the B’z I know. Can’t wait for an eventual release of it! The stage set, on the other hand, was very interesting. To the sides, there were two fire escape type of stairs, and an LED-lit “EPIC NIGHT” logo in the middle, which would change colors, etc. throughout performances. Also, on each side of the stage were two small screens which would be used to add effects such as a photo frame to the video being shown on them. In addition to those, the hall’s own screens were used as well, so that people in the back would be able to see at least a little bit of what was going on. There’s only one problem: The screens were so small, that, while you could see what was going on, they weren’t big enough to enjoy the whole thing. In other news, Tak didn’t just rock his new Firebird during the show, but also a Flying V during 「Las Vegas」 and a Gibson SG during some other song I can’t remember. And the MCs, wow. It really sounded to me that Koshi wasn’t prepared at all. In one of his talk sessions earlier in the show, he asked the audience if everyone went to see the cherry blossoms. Nobody replied, haha. This seemed to have left Koshi a bit uneasy, struggling to get a response from the crowd. Moreover, this show had a lot more jam sessions compared to prior shows I’ve been to/seen. So what do I think of this show? It wasn’t what I expected. I expected it to be a maximum hype show. Nevertheless, I still enjoyed it and was glad to be able to see my favorite band on stage again. And, more importantly, to meet up with all my friends and spend a great time together. After the show, we went to a nearby place and ate a whole lot of great food while playing B’z quiz, haha. One of my friends would play a split second of a B’z song, and the others had to guess what song it was. Much fun. But back to the show: I think that was to be expected since that is an album tour. I am not a huge fan of the ACTION LIVE-GYM, either. It’s enjoyable, but not the best B’z can do. I totally share the same feelings about Uchouten opening the show. That should have been Epic Day or Las Vegas (2 epic tracks). Uchouten is a song that should have been played in the middle when the hype is high so the crowd can go along. Am I the only one being disappointed with the setlist in general? “Atsuki Kodou no Hate”, “Baby, you’re my home” and “BURN -Fumetsu no Face-” are great, “Swimmer yo! !” is okay, but the rest… They perform “BLOWIN'”, “love me, I love you” and “TIME” almost always around that slot, “Don’t Leave Me” is well-known for returning every few years, “BE THERE” would’ve only been special if it hadn’t been played in 2011, “Ai no Bakudan” and “Ichibu to Zenbu” seem to be THE selection for the mainstream in recent years, and “ultra soul”… Though I knew that they wouldn’t change everything, I was hoping to see at least some of the Top 20 songs that fans elected in the magazine (except “HEAT”), for example “Kienai Niji”, “ROOTS” or “YOU&I”. There are still so many songs left unperformed, yet they perform the ones they always perform. To Tobias: More jam sessions? Do you remember what they were playing? I’m still irritated that Tak was playing “GO FURTHER”… That doesn’t sound fitting at all.